MAP is leasing 8 individual spaces on the third floor of its 218 West Saratoga Street building. All offices include use of a communal kitchen and public bathrooms located on floor three. Use of open conference space is available free of charge, on a 1st come first served basis, up to three times monthly. Rates range from as low as $155 – $250 a month. Utilities are included in the price. The MAP building is located between Park & Howard Street within the Bromo Tower Arts & Entertainment District. 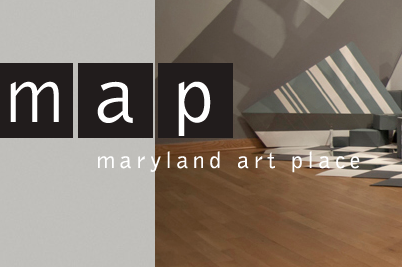 For more information or to schedule a tour of available space please email Paul: paul@mdartplace.org or call 410.962.8565. *Note – The building is not equipped to handle toxic waste; therefore all artistic practice and/or businesses must not include chemicals or similar by-products of your practice that are not easily disposed of through traditional waste management. The building services both Verizon and Comcast customers. Race Forward: The Center for Racial Justice Innovation in partnership with the Joan Mitchell Foundation is excited to announce a unique small grant opportunity for visual artists from across the nation to be featured at Facing Race: A National Conference. Facing Race is the largest multiracial, inter-generational and unique collaborative gathering space for racial justice movement making, organizers, educators, creatives and other leaders. Facing Race 2014 will be held in Dallas, Texas on November 13-15, 2014. Art activism has been known to give life to movements by using radical aesthetics to make visible the voices of often silenced communities of color. Race Forward is committed to providing a space for intersectional work and training by broadening the recognition of artists’ important contributions to the fight for racial justice. Visual artists are welcome to submit three works for consideration to be featured at this year’s Facing Race National Conference Art Gallery. An internal Arts & Cultural Committee appointed by Race Forward will select six visual artists to be featured. The deadline for applications have been extended until August 15th, 2014. Selections will be made on a rolling basis and artists will be notified by the end of August. For this purpose we define ‘Fine Art’ as visual art considered to have been created primarlily for aesthetic purposes and judged for its beatuy and meaningfulness, specifically, painting, sculpture, drawing, watercolor, graphics, and archutecture. Do not submit more than three works to be considered. Please email lgrant@raceforward.org with any questions. Submit to the annual small works show at the Maryland Federation for the Arts, which runs from November 28 through December 28, 2014, in Annapolis, MD. Artists may enter up to 6 pieces. Marcus Civin, Acting Director of Curatorial Practice at MICA, is the juror. Artworks have size restrictions of no larger than 11” on any side for 2-Dimensional works and no larger than 7” in any direction for 3-Dimensional works. Artist entries must be submitted through an online digital entry system by September 10, 2014. There will be cash awards totaling $1000. A. Aubrey Bodine, Herman Maril, Keith Martin, Glenn Walker, Amalie Rothschild, Betty Cooke, Joe Sheppard, Aaron Sopher, Jacob Glushakow, and Reuben Kramer? Their artworks were exhibited at Baltimore’s venerable Peale Museum, the old masters in 1823 (from local collections); the regional artists in exhibits of photographs and paintings depicting “Life in Baltimore” ca. 1950s–1960s. Free State at the Peale pays tribute to the museum’s 200 years of presenting fine art to the public. It is the first major event in the Peale Center’s $4 million capital campaign to breathe new life into this historic icon in the heart of downtown and make it a lively gathering place to explore Baltimore’s rich architecture and diverse history. The Peale is the oldest museum building in the United States. Rembrandt Peale, a member of the first family of American artists, opened it in 1814. It is a National Historic Landmark. The Peale has served many purposes in its long and colorful career, including a period in the mid-19th century, as Baltimore’s City Hall. The Peale Museum closed in 1997 with the demise of the City Life Museums. It has been vacant since then. The Peale Museum celebrates its bicentennial this year. The plan is to reopen it to the public in two years, coinciding with the 200th anniversary of the Baltimore Gas and Electric Company. In 1816, Rembrandt Peale lit one of his painting galleries with gas and soon founded the Baltimore Gas Light Company, ancestor of BGE. Free State at the Peale will be held at the Carroll Mansion, 800 E. Lombard St., a building close in age and proximity to the Peale Museum. The juried exhibition is open to regional artists showing recent works. The general subject is Baltimore and Maryland. All artworks will be for sale. The “Charles Willson Peale Prize” will be awarded for excellence in art. A portion of the exhibit will showcase artists who exhibited at the Peale Museum. If you own a Glenn Walker painting or Reuben Kramer sculpture, or know someone who does, and want to support the Peale Center, please contact exhibit coordinator John Ferguson via terrymiller@prodigy.net or 410-455-9219. Free State at the Peale opens Saturday, November 1, 2014, 6:30–9:30 p.m. The first hour will be a VIP champagne reception for donors. At 7:30 p.m., the public will be welcomed to the Carroll Mansion to view the artworks. Silhouette artist Lauren Muney will be on hand to cut silhouettes of guests (as was done at the original Peale Museum). Following the opening, Free State at the Peale will be open to the public Fridays, 4–8 p.m. (Friday following Thanksgiving, 1–6 p.m.) and Saturdays and Sundays, 12 noon–4 p.m. Visitors after opening night will pay the Carroll Mansion’s usual $5 admission charge. 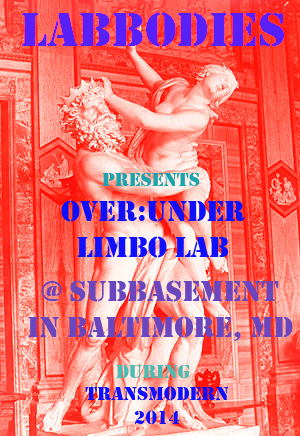 Labbodies Performance Laboratory is teaming up with Transmodern Festival and Subbasement Gallery to produce our most ambitious lab night yet, OVER UNDER LIMBO! The Labbodies team will transform Subbasement Gallery into a cavernous entry/exit point to the shadowy world of Over Under Limbo, a mercurial world populated by national, regional and local Performance Artists for two nights only! We will incorporate both the Garden of Elysium, The River Styx and other nooks and crannies of the domain of Hades into our installation. Over Under Limbo, is an exploration of the space in between the underworld and paradise (limbo). Hades, is the god of the underworld, but the underworld is not all dark and dreary. The story of Hades and Persephone is well known. But what would happen if Persephone took control? How would the story end if she had the power over her sexuality and the underworld were ruled by her? Performance artists from near and afar are encouraged to submit proposals for performance works that includes the mythology of the Underworld, any narratives that include Hades, Persephone, or any of the Gods (greek or otherwise) whose stories you want to re-tell through experimental performance art (short and durational, installation, projections, spoken word, dance, song etc). Both emerging and established performance artists are strongly encouraged to apply. 4. 2 hi-resolution images that best represent your work. About LabBodies: LABBODIES is a Performance Art Laboratory in Baltimore MD dedicated to showcasing artists who work-out in the arena of Performance Art*. The Barrie School and Winter Growth, an adult day and assisted living facility, are teaming up with The Art Gallery of University of Maryland to offer this exciting teaching artist opportunity. This Artist in Residence position is ideal for someone committed to engaging the community in an experiential art installation project. Applicants should have an interest in educating learners of all age levels, community outreach, and generational diversity. The intent of this residency is to strengthen the ties between three educational facilities for different age groups through art. The artist will have the opportunity to work with students from Barrie School (pre-k through 12th grade), University of Maryland (undergraduate and graduate program), and Winter Growth (adult care facility) to create a public art installation. Applications are due 9/5.